This is an image that was stacked from 4 - 300-second exposures acquired between 20:24 and 20:49 UT on April 6, 2008. The comet is the object left of centre. Sky conditions were not bad, SQM sky background was mag 20.4 / sq. arcsec. 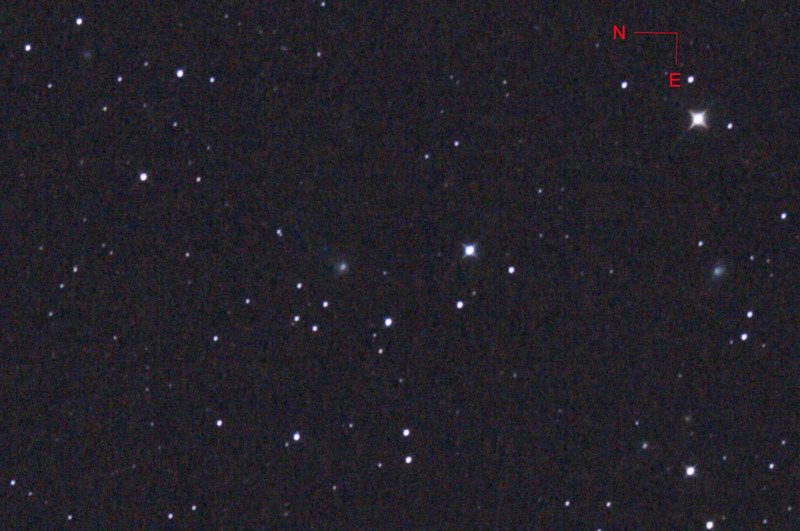 The smudge on the right side of the image is a galaxy UGC 7354 which is listed ad magnitude 14.4 . This is a 100% pixel size crop from the ful image. The image was made with an ASA N8 20cm f2.75 astrograph and a Canon 40D @ 800 ISO.